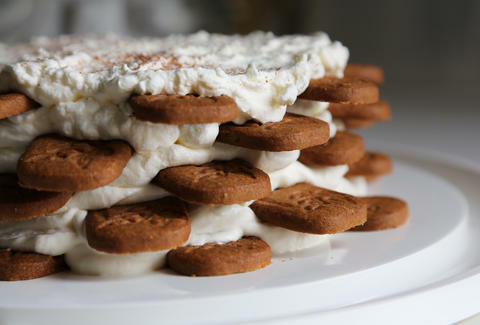 Mrs. Fields, your longterm stranglehold on the cookie-cake world is being challenged: PopSugar recently put together a recipe for Speculoos Icebox Cake, a monolith of whipped cream and those Speculoos cookies that Trader Joe's famously pulverizes into delicious cookie butter. You don't even have to bake this sucker, making it the simplest cake you've made since you wrecked your sister's Easy-Bake. Learn how to make it over at their site... after you've completely raided TJ's shelves. Kristin Hunt is a food/drink staff writer for Thrillist, and still envies Mrs. Fields' cookie cakes. Follow her at @kristin_hunt.